Glass bricks from recycled glass in organic shapes, designs for a hyperloop station in Amsterdam, and a chaise longue created from 3D robotic printing. These three projects from students and researchers of Architectural Engineering & Technology are now on display at the Dutch Design Week 2018. Reduce, reuse, and recycle glass. PhD candidates Faidra Oikonomo (BK Bouwkunde) and Telesilla Bristogianni (Civil Engineering) want to greatly increase the sustainability of glass as a building material. 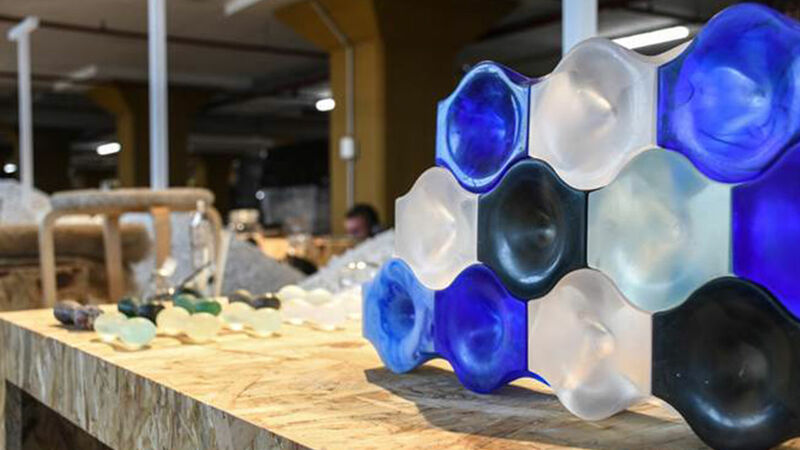 From recycled glass, they cast glass in fluid and organic forms, creating glass components that can be stacked without glue. Every building from these bricks can eventually be dismantled and the components can be reused. Their project has been nominated for the New Material Award 2018, the winners will be announced on 20 October 2018. Read more about their project here. 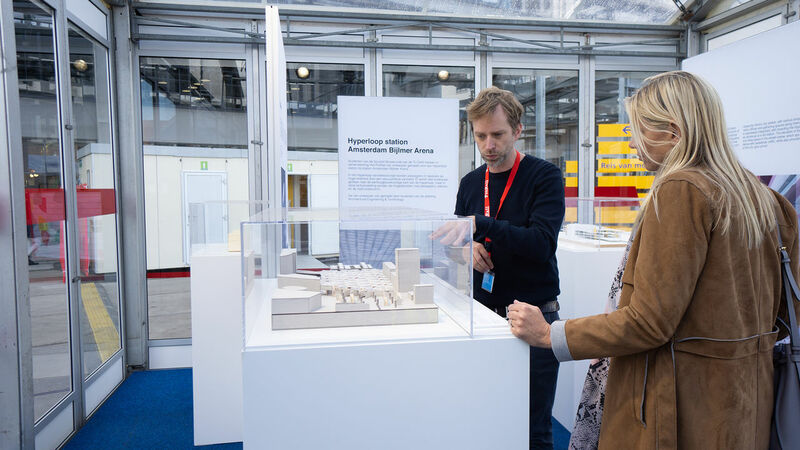 Students of Building Technology worked on a series for designs for a Hyperloop station at Amsterdam Bijlmer Arena, in collaboration with ProRail. During the Innovation Expo on 4 October, they show what Hyperloop could mean for travellers, station, and the city. Read more about their project here. 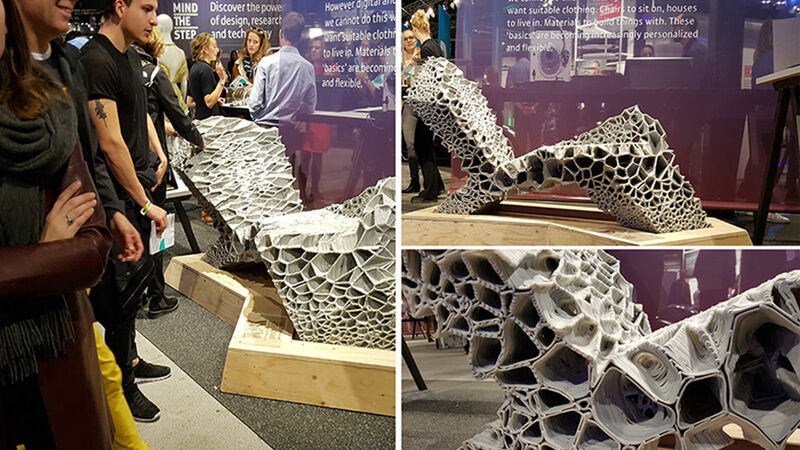 The chaise longue by researchers Henriette Bier and Arwin Hidding is a multi-functional chair created from 3D robotic printing. The chaise longue can change shape, making it possible to use the object as both chair and bed. Numerical and experimental studies employing structural analysis, robotic path simulations, and 3D robotic printing have led to the implementation of adaptive structures. This means the user can either sit or lie down by deforming the chaise longue with their weight. The shape change is achieved by combining variation in material distribution and the use of thermoplastic elastomers. Read more here and see how the chair was built. The Dutch Design Week 2018 is organised in Eindhoven until 28 October 2018. Get tickets and plan your visit here.